Adventure takes to the high seas in PAW Patrol Sea Patrol. 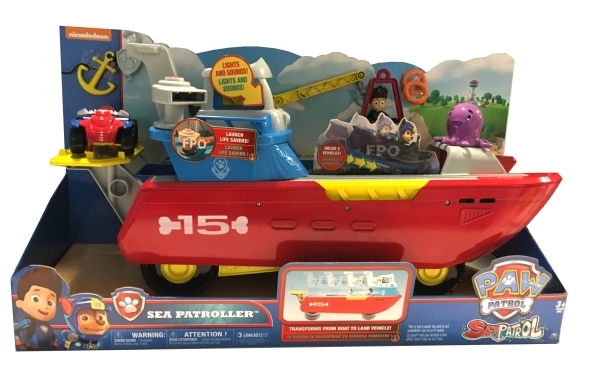 The PAW Patrol's missions will take them to Adventure Beach where they will be lifeguards and when duty calls, the pups will board the Sea Patroller for water based rescues! The pups will dive deep with the Sea Patroller as they visit new and old friends below the surface and do what they do best: save the day! Søpatrulje-skib som er hele 71 cm lang. Skibet kan transformeres til køretøj. Skibet har lyd- og lysfunktioner og livredderfunktion. Der medfølger blandt andet 2 små køretøjer og 2 figurer. Kræver 3 LR44 batterier (inkluderet). Alder 3+.